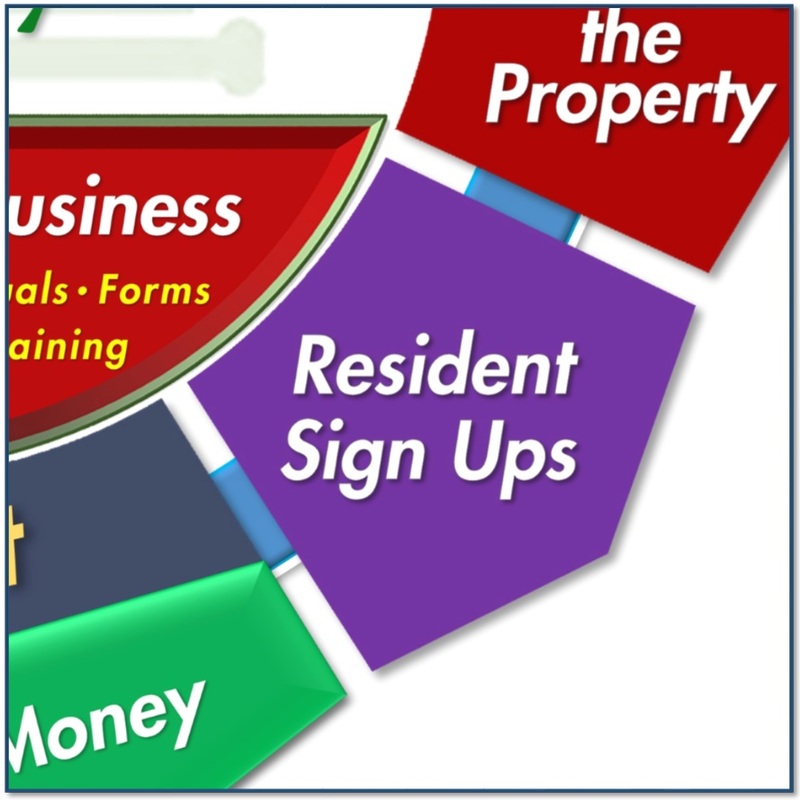 This page lists all the documents you will ever need signing up new tenants. There is a link to find materials for sale, and then under that is a download button for members. Contact us about full access membership. 1. The Residential Rental Agreement: a fully editable lease document that you will add your name to, make some adjustments for fees and percentages, add your brand and be up and running in minutes. 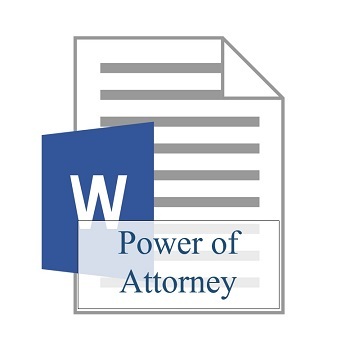 You would pay an attorney several thousand dollars to get this document and you still wouldn’t have all the writer’s experience and all the money-making ideas. 2. 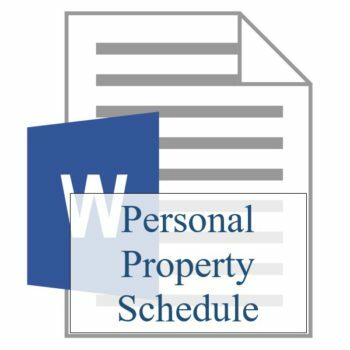 Instructions to Adapt the Residential Rental Agreement to Your Company: instructions to Adapt the Residential Rental Agreement to Your Company Another document to help you fill in the right information so your final agreement says exactly what you want. This document identifies 22 blanks to fill in so you don’t miss anything in the agreement to adapt it to your model. 3. 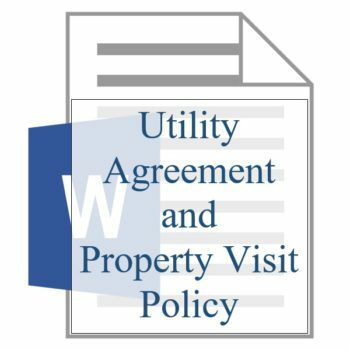 Residential Rental Agreement with Instructor’s Notes: a full document filled in with instructor training notes after every paragraph (14 pages long) addressing each issue in detail. 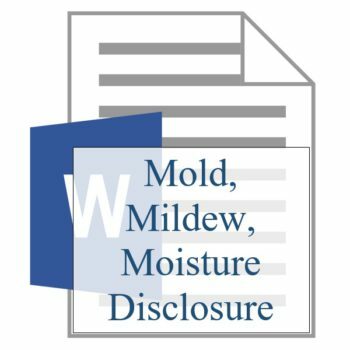 The three documents above are only sold within a package. 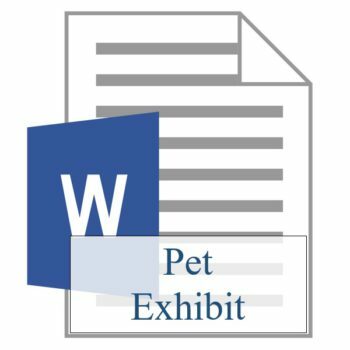 Be sure every tenant signs a pet exhibit so every detail is covered on every lease. If they have a pet you want them to tell you breed, weight, color and name so they don’t sneak in a different one. You also want to remind them of the six things they need to do after move-out to get their deposit back. If they don’t have a pet you need to remind them of the costs, penalties and process you’ll go through if you discover a pet. Let them know there are serious penalties if they try to hide one from you. 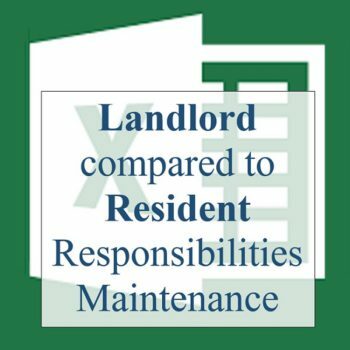 You should articulate exactly what maintenance issues the tenant is responsible for in writing. This document addresses the nuisance items you are trying to prevent like after hours maintenance, missed appointments, flipping GFI switches, resetting garbage disposals, changing out all light bulbs and other nickel-dime nuisance maintenance items. We’ve learned the precise balance between pushing off habitability issues to them (which you must not do) and holding them responsible for nuisance maintenance calls. 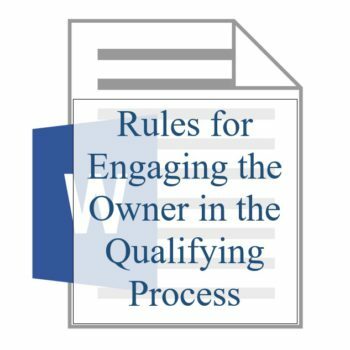 Owners frequently ask, “how do you prevent/manage tenant’s request to complete unnecessary repairs and running up the owner’s tab?” This document will help answer that question. This is a big CYA document. If the HOA does stupid by booting the tenant’s car because the owner hasn’t paid his dues or threatened to evict the tenant you need to be protected from litigation. The owner will ignore the HOA to get it leased and you’ll deal with the battles when the HOA wakes up to the reality that there is a new tenant in the community. You want the tenant giving you a hold harmless agreement when the HOA can’t open the pool or tennis courts because not enough owners have paid their dues. You need to protect yourself against the possibility of being sued for constructive eviction, wrongful dispossessory, loss of quiet enjoyment or harassment by the HOA. Tenants want to blame you for everything no matter whose fault it really is. Protect yourself. 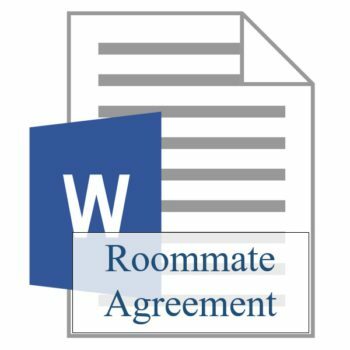 When three guys want to move in together make sure you get them on a separate document outlining your requirements for roommates. 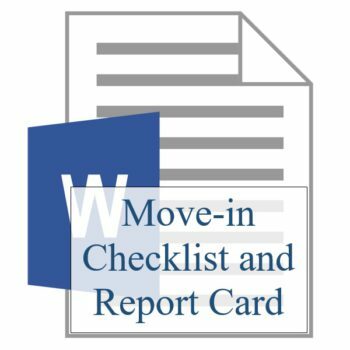 Remind them that you’ll only take one rent check (not three) and that you’ll only cut one check back to them after move-out. Make sure you disclose that you’ll go after the one with great credit no matter who trashed the property. Let them know up front that you’ll never drop anyone off the lease whether they still live there or not. Roommates love each other when they move in but like other community efforts they go astray more often than you think. The last thing you want is to suggest to a tenant that the hot tub will stay hot or keep working. Disclose your lack of knowledge with hot tub maintenance and your general unfamiliarity with how they work. Put the entire burden on them and warn them about the dangers of it getting to hot and someone getting burned. You may even require they get renter’s insurance with you (and the owner) as additional insured. 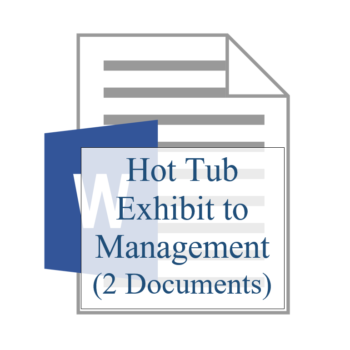 See our document on the owner sign up documents for the other side of the hot tub issue. Often only one tenant will be able to attend the move-in inspection or will not be around to sign the lease. For many reasons you need to get comfortable completing a POA. One tenant can sign for the other tenant if you have a POA. We use them often. 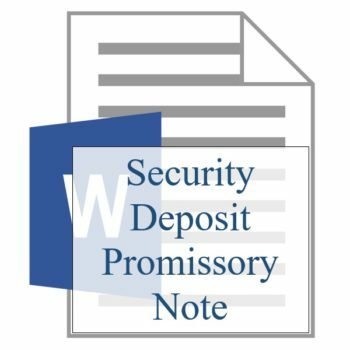 You just email this document to them, they fill it out (or you fill it out in advance), they print, execute, get a notary and you’re up and running. This is a very common document and you’ll find lots of uses for it. This is not the practice of law so don’t let your broker or attorney talk you out of it. It’s just filling in the blank like you do on every lease or sales contract. 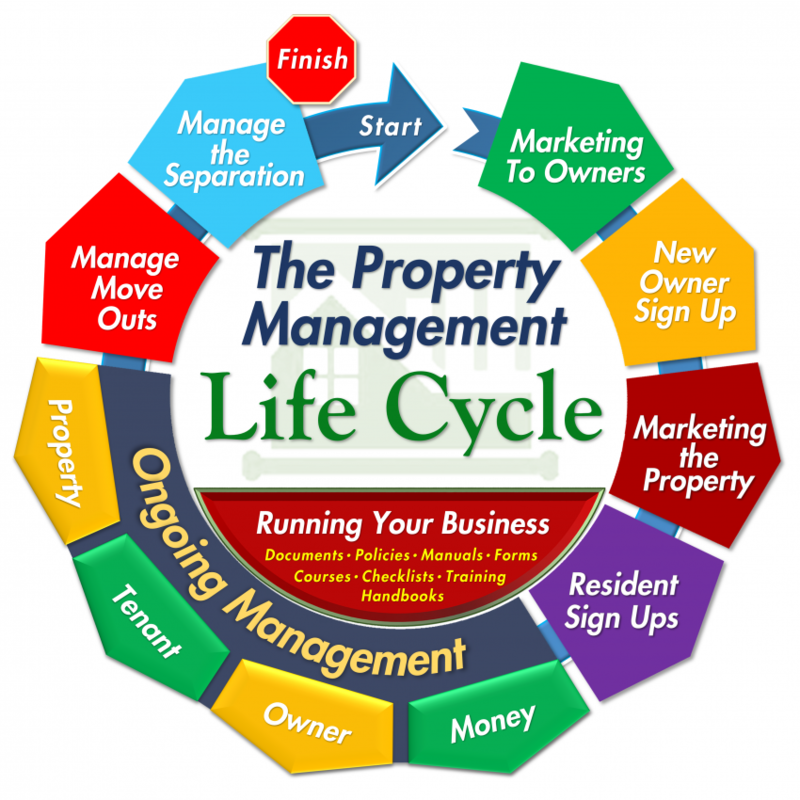 It’s a standard operating document for property managers. When the owner leaves behind their lawn furniture, pool table, lawn tractor, counter top microwave you need a form to list everything and language that has the tenant promising to leave it behind when they leave. They won’t, but you need to make a stab at it to impress your owner. There is little you can do to protect the owner from this stuff growing legs and walking away but the owner wants you to make an effort. This document fulfills that duty to the owner. Occasionally the house is not clean enough, repairs have not been completed, carpets didn’t get clean enough or the handy man (or owner) didn’t clean up his mess. Some tenants want to hold your feet to the fire for five years and remind you what a bad job you did at move-in. This document takes all the air out of them by saying “you shouldn’t take this property now. Let’s retry this inspection in a couple of days so we can get this right.” Many can’t wait and will press to take it “as is”. 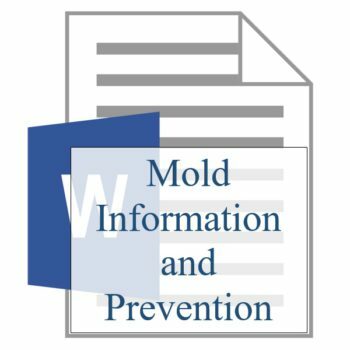 This document says “you’re recommending they not take it today, but wait, and let us make it right.” Sometimes they must have possession today, and will agree to ‘not hold it against you.’ This is “the moving van is in the street and I’ll take it anyway” document to cover the manager. This document is a result of getting beat up many times when we let people take a property that is not ready. When you know the tenant is military, or works for a military support company, and qualifies for a military out clause in their lease, you want to make sure they don’t take advantage of that federal out privilege. They have requirements to fulfill and just saying “I’m being transferred and you can’t hold me to the lease” doesn’t cut it. This document lays out the rules for military release of tenancy without your giving up your rights. 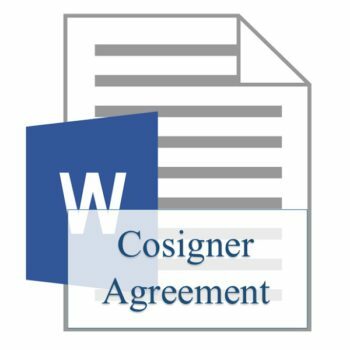 When there is a cosigner you need a document for them to sign promising to pay what the tenant left owing when they move out. This is their personal guarantee for the tenant’s obligations on the lease. We have made lots of mistakes with this idea over the years and now have it down pat. We get co-signors on about 20% of our leases and it works like a charm. Don’t reinvent the wheel. Let our mistakes make it easier for you. When a tenant previews a property and sees a security system it is reasonable that they expect it to be up and running when they move in, and that it is included in the rent. You need to dispel that expectation and protect yourself from the liabilities of what happens if it fails. 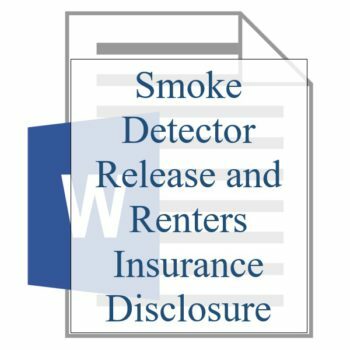 This is a CYA document letting the tenant know that it is their responsibility to deal with the monitoring system and the cost belongs to them. You are not making any representations as to its reliability, its functionality or its cost. You know nothing, see nothing and they agree to hold you harmless if the system does not function properly. We often get more than one month’s rent as a security deposit. Depending on their credit we will agree to take installments on some of that deposit. We did it badly for many years and struggled with getting judges to enforce our documents. We finally went to our attorney and paid to get it right. Now we are able to enforce this document and evict for failure to pay as agreed. It’s not 100% but we are successful 85% of the time. Taking installments on the deposit probably needs the owner’s approval depending on your model. 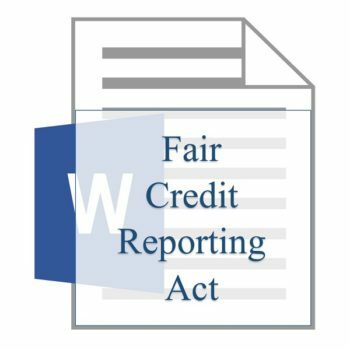 This act lays out the requirements for anyone pulling credit and other private information. This is the law everyone must follow when viewing, transmitting and storing applicant’s personal information including owners and property managers. Fines for violations of this act are $37,500 per event so the FTC is serious about compliance and claims of “I didn’t know” won’t save you. 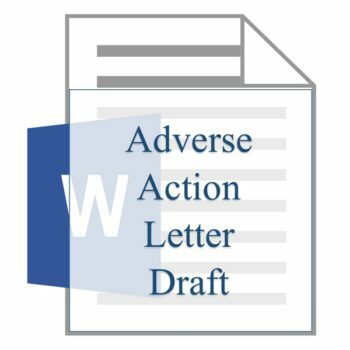 We took the entire act updated May 2016 and condensed it in attempt to address the issues pertaining to property managers gathering data on tenant applicants and added training notes, underlined specific words and bolded some critical language so you can read the law and our thoughts as to how the law plays out in the actual day-to-day practice of qualifying applicants for rentals. 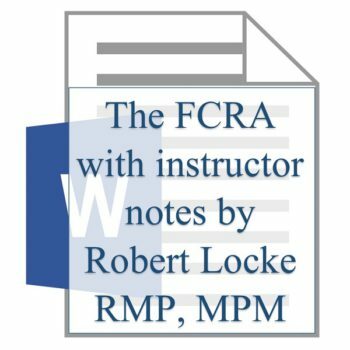 This is more of a training document for you and your staff to review yearly to refresh yourself (or train your new folks) as to the seriousness of the law and the practical implications of it. This is a 30 page manual we developed over 35 years that guided us through a lawsuit-free experience in processing our applicants. Most of this was done ‘in-house’ as the tenant screening services (TSS) available were not practicing during most of our years so there was no one to pass this off to. We had to learn how to do it and so do you. This document guided our managers to treat all applicants properly as it related to credit scores, secondary income streams, trust babies, no employment, retired applicants, applicants without green cards, foreign nationals, roommates, foreclosures, special needs occupants, spouses with bankruptcies, 3rd-party signers, corporate leases, comfort pets and more. The manual is full of training notes and can be used to train your staff how to do it right and avoid expensive learning curves we’ve already paid for. It can be tweaked to your model and then shrunk down for your staff to use day-to-day as they manage the application process. Some won’t (or don’t want to) spend the money to get all the tools and training in this manual so we’re offering a shrunk-down version. If you want a basic framework for setting qualifying guidelines, a place to start is this shorter version of the full manual that provides a leg-up on the process. With this document you’ll be able to develop your own set of guidelines over time. This document (and training notes) will lay out what each credit score will require for approval, plus a chart laying out who should be managing the process for each category of applicant. You can use this do-it-yourself version and work through your own learning curves over time. When you deny someone or change the offer (like requiring an additional security deposit) you MUST send this official notification disclosing the source of the information used to make your decision. This is required every time you deny an application or change the terms of your approval. We’ll give you several examples and training notes for completing one. No matter what your model, there are some important rules you must follow when presenting applications to the owner. There is certain information you should never share with the owner under any conditions and some things you don’t want to miss passing over to them. Knowing the difference is the topic of this package. We’ll answer the question what’s the safe way to satisfy the owner’s appetite for information, without exposing yourself (and them) to violations of the Fair Credit Reporting Act, HUD, Americans with Disabilities Act, Service members Civil Relief Act and a host of other laws that govern the handling of the applicant’s personal information.